By Anastasia Tomazhenkova: A conservationist reported a Sumatran tiger was caught in a trap in western Indonesia, shot dead and skinned. A soldier, who killed the endangered tiger distributed its meat to villagers. The incident happened Sunday in Tenggayun, a village in Riau province, after residents asked the soldier to help release the critically endangered animal from a pig snare, said Bastoni, an official with the Sumatran Tiger Conservation Program. "Instead, the soldier fired nine bullets to its body and head, and then asked villagers to skin the wild beast," he said, adding the man proceeded to dole out the meat and take home the tiger's pelt. Bastoni - who like many Indonesians goes by only one name - said he intends to file a complaint with the army. 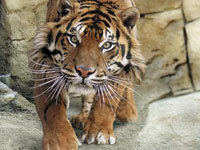 The Sumatran tiger is a subspecies of tiger found on the Indonesian island of Sumatra. Environmentalists say the Sumatran tiger, or Panthera tigris sumatrae, is the most critically endangered tiger subspecies in the world, with fewer than 400 believed to be left in the wild, occurring predominantly in the island's national parks. Recent genetic testing has revealed the presence of unique genetic markers, indicating that it may develop into a separate species, if it is not made extinct. This has led to suggestions that the Sumatran tiger should have greater priority for conservation than any other subspecies. Habitat destruction is the main threat to the existing tiger population, logging continues even in the supposedly protected national parks. Sixty- six Sumatran tigers were recorded as being shot and killed between 1998 and 2000 - nearly 20% of the total population.